A muscle car is, by general definition, a light, aerodynamic car with a powerful engine, and the Ford Motor Company delivered several classic Ford muscle cars to the world of cars. Browse through this list of eight Ford muscle cars, and see if your favorite is on the list. 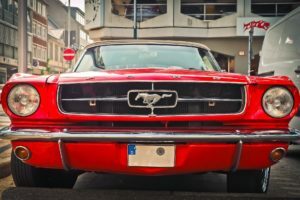 Mustang: Whether you prefer the earliest pony body, the fox body of the eighties, or the newer Fox4 or D2C Mustangs, no list of Ford muscle cars could be complete without one (or several) of this iconic muscle car’s seven generations included. Galaxie: The Galaxie has a slightly different, boxier, heavy look than most muscle cars, but the engines got more powerful with each new iteration over the years to deliver the muscle. GT and GT40: This one might be debatable in terms of a traditional muscle car, because so few were ever made and it was really a classic race car, but it delivered the muscle, so ti gets its spot on the list – this mid-engine race car, according to Car and Driver, there were less than 135 built – between ’66 and ’69 it won four 24 Hours of LeMans. Capri: The Capri never really caught much attention in the US, as it was a European pony car, but it was built with pony car styling and a Cortina engine to meet European standards. Fairlane: The Fairlane was the predecessor to the Torino, and it wasn’t the fastest of Ford’s muscle car lineup, according to StangTV, but it delivered the muscle car look, slightly similar to the body style of the GTO. Torino: When the Torino rolled off the line, it delivered, according to Old Ride, a comfortable ride combined with true muscle car power. Gran Torino: The Gran Torino went through several changes from earlier Torinos, including engine upgrades, a floor mounted four speed manual transmission system, an upgraded suspension system, dual exhaust, bucket seats, a larger body, pointed grilles, and longer lines. Part of the reason Classic Cars Online US exists is to help connect classic car buyers and sellers, and we’ve added several ways for you to connect – pick your favorite, or join us in all four places: (1) sign up on the Classifieds page here on the site, (2) visit and like this site’s Facebook page, (3) the Best Classic Cars for Sale page or (4) join the Classic Cars Online: Classic Cars for Sale group if you are looking to buy or sell classic Ford muscle cars.